Secret Sanctum of Captain Video: From Savior to Slaughterer...the Saga of MING! From Savior to Slaughterer...the Saga of MING! After dominating three movie serials, Ming did not appear in the 1950s Flash Gordon tv series. ...the man called "the Merciless" was front-and-center! Minor segue: In the 1970s, a young filmmaker (and major Flash Gordon fanboy) named George Lucas wanted to do a feature film version of Flash. The character's owner, King Features Syndicate, turned him down, feeling that a guy with only two films (THX-1138 and American Graffitti) didn't have sufficient cinema cred to do the character justice...so they sold the rights to Dino DeLaurentis, who had already done successful movies based on Euro-comics Barbarella and Danger: Diabolik! Dino, who was a major European comics fan, but knew little of American material, gave the scripting assignment to Lorenzo Semple, Jr, who had shaped the campy style of 1960s Batman tv show, and the directing reins to Mike Hodges, a competent director who had never done a big-budget film before. Add a leading man as Flash who re-defined the term "wooden", and even Dino realized he needed someone with serious acting chops to kick-start the on-screen action. Correction, he got the award-winning actor who played Jesus Christ in The Greatest Story Ever Told...Max von Sydow! Many are the rumors as to why von Sydow, noted for doing Ingmar Bergman movies and similar high-brow cinema, would do such a film, but it came down to two things...lots of money, and a chance to experience the movie equivelent of hanging out with lots of friends and having fun! While Sam Jones as the lead was almost a black hole on screen, the supporting cast included Timothy Dalton, Ornella Muti, Topol, Mariangela Melato, and Brian Blessed. Yet, von Sydow dominates them all. ..von Sydow demonstrates his range from smirking satisfaction to almost primal-scream rage, and everything in between. In this incarnation, Ming is the ultimate over-the-top villain. He doesn't need a logical motivation for doing what he does, just his own desires and lusts. BTW, you can read the comic book adaptation of the 1980 feature film HERE! It's drawn by Al WIlliamson, who not only illustrated a number of Flash's comic adventures, he also did the comic book versions of The Empire Strikes Back and Return of the Jedi! 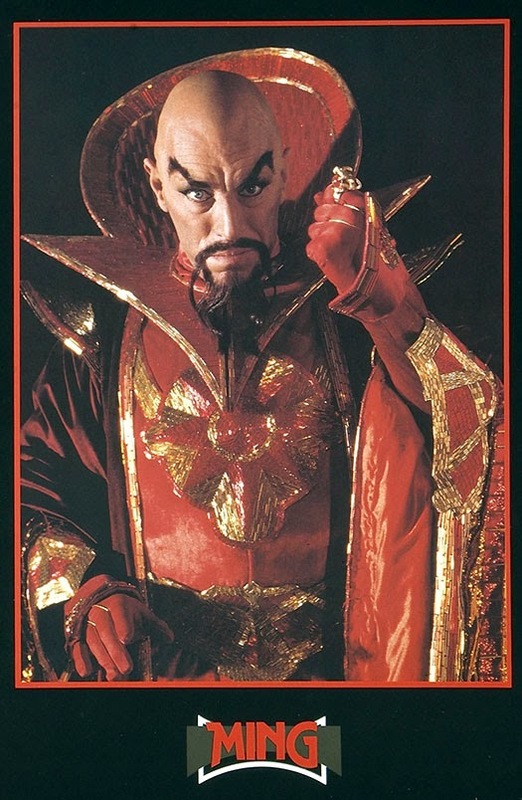 Every version of Flash Gordon since, live-action tv/animated/comic, has featured Ming as the antagonist. No other villain is as connected to a hero as Ming is to Flash. There have been Superman productions without Lex Luthor, Batman movies without The Joker, but Flash Gordon without Ming is all but inconceivable! and you can see many other movie villains by clicking HERE! HOW did this film escape my notice?! I did not know there was a big Ming film in the late 70s-early 80s. So if Ming survives in the end of this latest movie, is there any news of a re-boot? It would be interesting to see Ming in our age of high-def 3d CGI filmmaking. Thanks again for joining our blogathon and for featuring the Magnificent Ming! Unfortunately, the movie did poorly in America, but well in Europe and Asia. It really found its audience on cable and home video. Currently available on DVD/BluRay for $14.99 or less. Pick it up, make some popcorn and ENJOY! 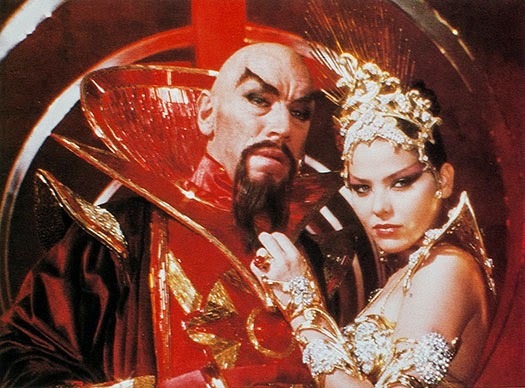 I really enjoyed your contributions to the blogathon, even though I've only seen one movie with Ming the Merciless -- Flash Gordon, the one that came out in 1980. I especially liked all the background information -- good stuff! 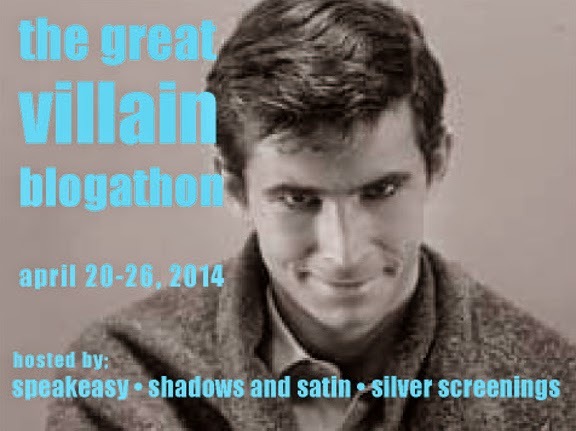 I hope you'll join our journey into villainy again next year!